1 Completely Fill out the Form at the Bottom of this Page. 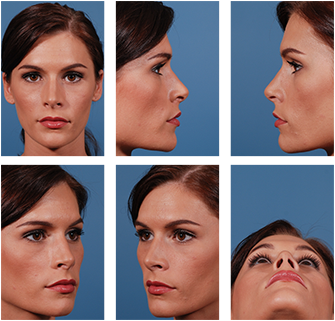 Have the six(6) required pre-operative photos taken of the area of the body you wish to improve. The photo set should include two(2) side views, two(2) three-quarter views, one(1) forward facing, and one(1) with the area of the body tilted back. Please view the examples below as reference. In order for our doctors to adequately assess your candidacy, the photos must be taken in good lighting against a solid-colored background. There should be no shadows on the face. You can take the photos at home, using any camera with a zoom lens, by fully zooming in on the face. However, ordinary point-and-shoot cameras are not recommended because they distort the image too much for the resulting photos to be helpful. You may also have the pictures taken at any portrait studio. 4. What is your reason for seeing the doctor? Do you or any member of your family have difficulty with prolonged bleeding when cut? Do you or a member of your family bruise easily? Do you have a problem with excessive scarring or have you ever formed a keloid after being cut? Have you or any member of your family ever had a problem with anesthesia? Have you ever had any psychiatric problems, a nervous breakdown or been under the care of a psychiatrist? Communications through our website, contact forms or via email are not encrypted and are not necessarily secure. Use of the internet or email is for your convenience only, and by using them, you assume the risk of unauthorized use. By checking this box you hereby agree to hold Dr. Cochran & The Dallas Rhinoplasty Center, its doctors, employees and affiliates, harmless from any hacking or any other unauthorized use of your personal information to or by outside parties. Any e-mail messages submitted or generated from use of this site and any documents subsequently attached to messages are confidential and may contain information that is protected from disclosure by various federal and state laws, including the HIPAA privacy rule (45 C.F.R., Part 164). This information is intended to be used solely by the entity or individual to whom this message is addressed. If you are not the intended recipient of emails or electronic communications generated by use of this site, be advised that any use, dissemination, forwarding, printing, or copying of any message without the sender's written permission is strictly prohibited and may be unlawful. Accordingly, if you recieve any message in error, please notify the sender immediately by return e-mail or call 214.369.8123, and then delete such message.